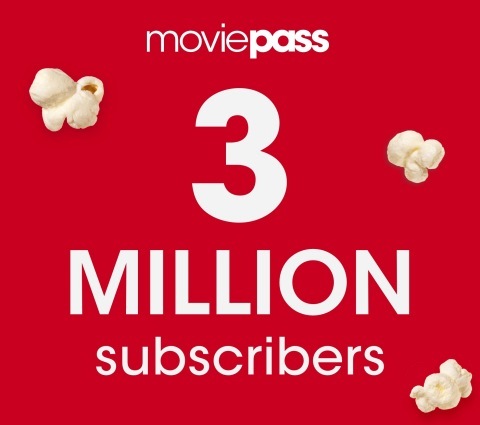 MoviePass™, the nation’s premier movie theater subscription service and a majority-owned subsidiary of Helios and Matheson Analytics Inc. (Nasdaq: HMNY) (“Helios”), announced today that it has exceeded 3 million paying subscribers since announcing its low-cost subscription plans in August 2017. MoviePass’ rapid growth is within its projections that estimate the service will exceed 5 million paying subscribers by the end of 2018. MoviePass currently represents more than 5% of total U.S. box office receipts, with its peak weeks nearing 8% of box office. When actively advertising select films to its subscribers, box office receipts have seen weeks push to over 30%. As a subsidiary of Helios, MoviePass has substantially driven Helios’ growing presence in the entertainment industry. Helios recently acquired Moviefone™, a multimedia information and advertising service, from Oath Inc., a Verizon company, which has enabled MoviePass to expand its advertising offerings. In addition, Helios’ subsidiary, MoviePass Ventures, has already acquired economic interests in films and teamed up with MoviePass to drive box office for those films, which Helios believes will maximize downstream revenue opportunities. Helios’ recent announcement of its deal to buy the film library and current production slate of Emmett Furla Oasis Films and its launch of MoviePass Films with veteran producers Randal Emmett and George Furla, further expands Helios’ ability to self-generate new revenue opportunities for MoviePass. MoviePass Ventures acquired an economic interest in the critically acclaimed film American Animals with The Orchard, a film and music distribution company and a subsidiary of Sony Music Entertainment. The theater debut of American Animals represents one of the year’s most successful independent films, thanks, in part, to marketing efforts orchestrated by MoviePass and The Orchard. Additionally, MoviePass Ventures holds an economic interest in the John Travolta film, Gotti, premiering this Thursday in New York City. MoviePass Ventures and MoviePass Films uses MoviePass to market its films to MoviePass subscribers, strengthening the box office performance of these films, which in turn maximizes downstream revenue opportunities for MoviePass Ventures from home entertainment (video-on-demand (VOD), subscription video on demand (SVOD), electronic-sell-through (EST), physical-sell-through (DVD, Blu-ray, 4K) and other forms of content distribution beyond the theatrical window). Such forward-looking statements are based on a number of assumptions. Although Helios’ management believes that the assumptions made and expectations represented by such statements are reasonable, there can be no assurance that a forward-looking statement contained herein will prove to be accurate. Actual results and developments (including, without limitation, the potential benefits of Helios’ partnership with Emmett Furla Oasis Films through MoviePass Films, the ability of MoviePass Ventures or MoviePass Films to maximize downstream revenue opportunities through joint marketing or advertising activities with MoviePass, the ability of Helios to derive economic benefits from increases in the number of MoviePass subscribers and the ability of MoviePass to reach 5 million subscribers by the end of 2018) may differ significantly from those expressed or implied by the forward-looking statements contained herein and even if such actual results and developments are realized or substantially realized, there can be no assurance that they will have the expected consequences or effects. Risk factors and other material information concerning Helios and MoviePass are described in Helios’ Annual Report on Form 10-K for the fiscal year ended December 31, 2017, its quarterly report on Form 10-Q for the quarter ended March 31, 2018 and other filings, including subsequent current and periodic reports, information statements and registration statements filed with the U.S. Securities and Exchange Commission. You are cautioned to review such reports and other filings at www.sec.gov.